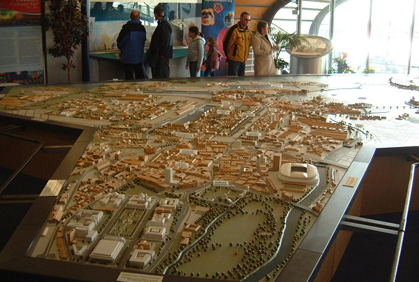 This is an ideal scale for creating masterplan models of wider development zones or even whole cities such as the Cardiff City model shown below. 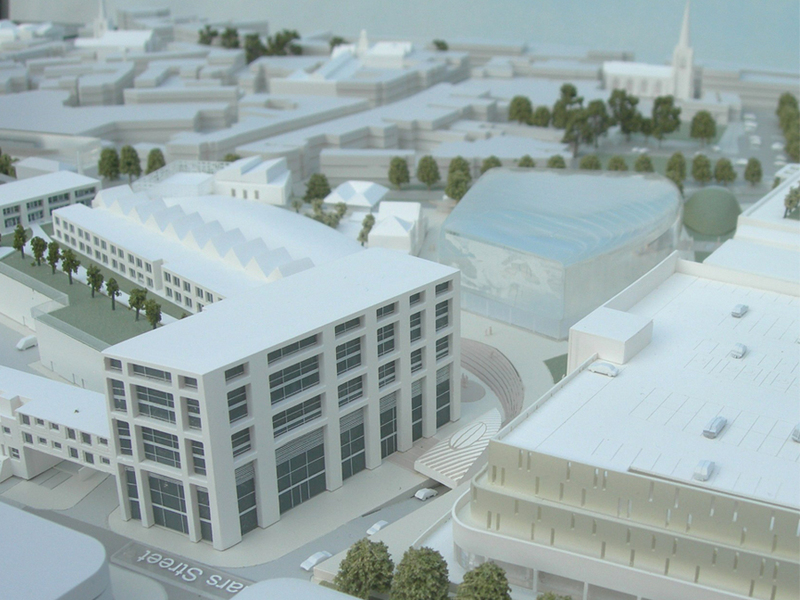 Although this small scale is mostly used for simplified massing models we can show a surprising level of detail if required, for example where a landmark building needs to be highlighted for some reason. Click on the images below and you’ll see the varying levels of detail that can be achieved. 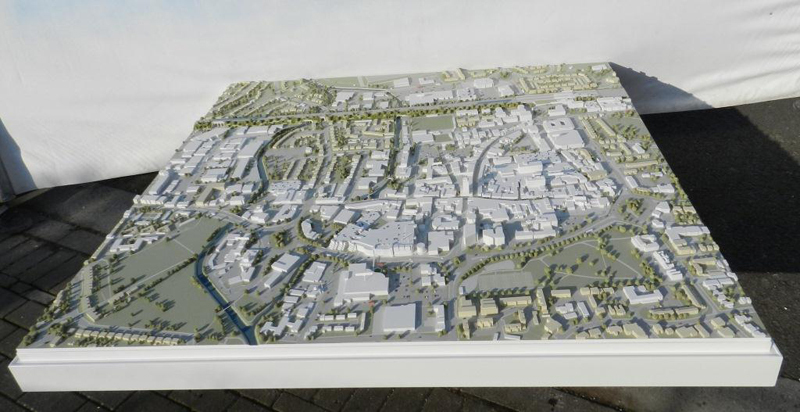 Cardiff City Masterplan Model 1:750 is an ideal scale for masterplan models showing an overview of large redevelopment areas. 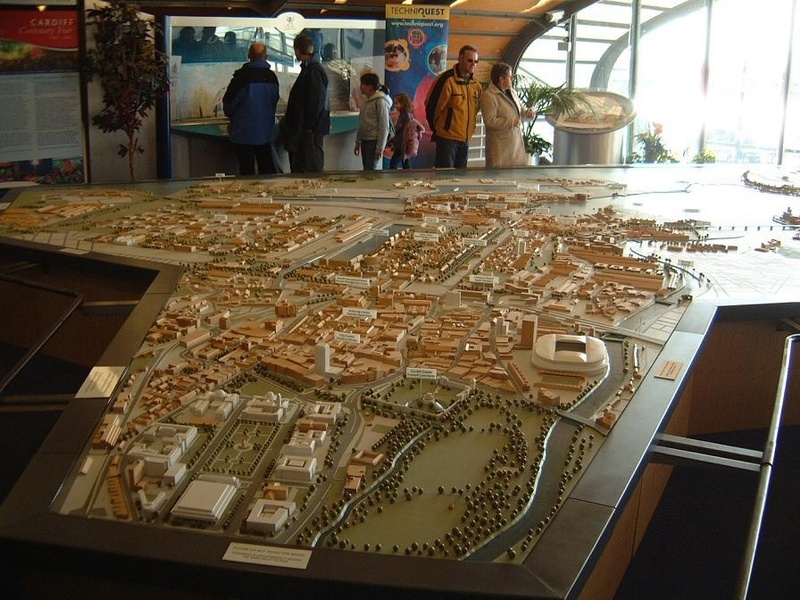 This 6.5m x 5.5m interactive model of the city of Cardiff took almost 5 months to design and build. 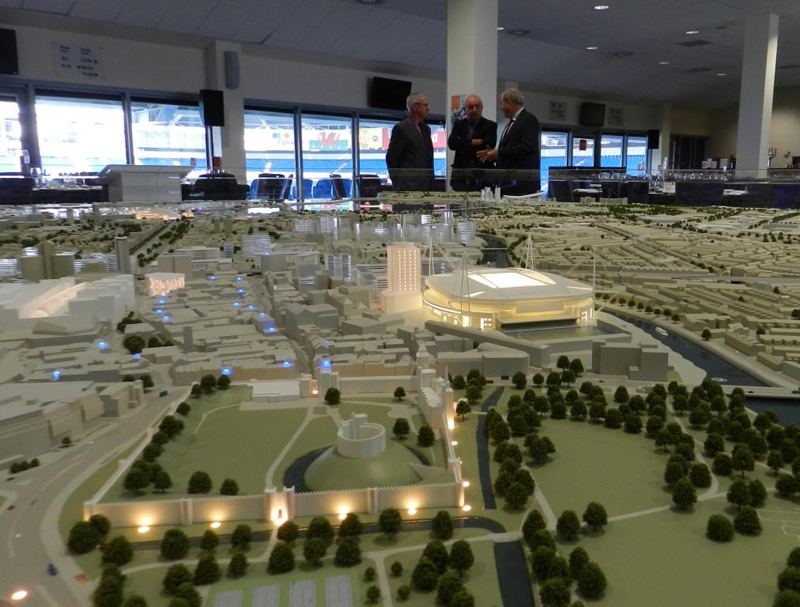 The model has been designed for use in a permanent marketing suite to promote the city of Cardiff to national and international investors. It is a fully interactive model controlled via a large touchscreen which activates over 30 different lighting zones on the model and at the same time displays relevant information pages on the screen. The screen images are also projected onto a large screen so that the information is visible to all. Saint Petersburg Marina One of the most significant features about this model is the high level of detail that can be achieved at this very small scale (all buildings are under 35mm tall). 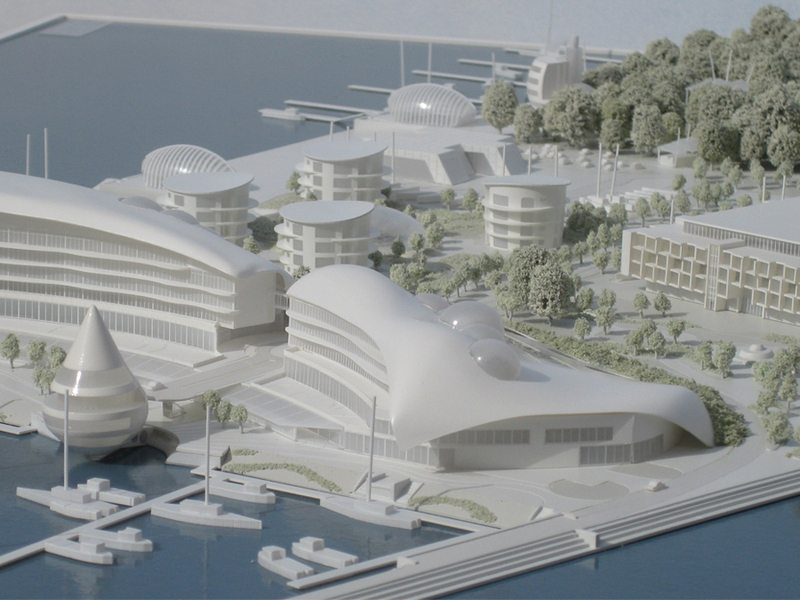 And for added impact, the buildings could all be illuminated at the touch of a button (see Illuminated Models section). The model was built on a very tight schedule and shipped off to Russia (in a purpose-built flight box) to be used as the centrepiece of a major presentation. 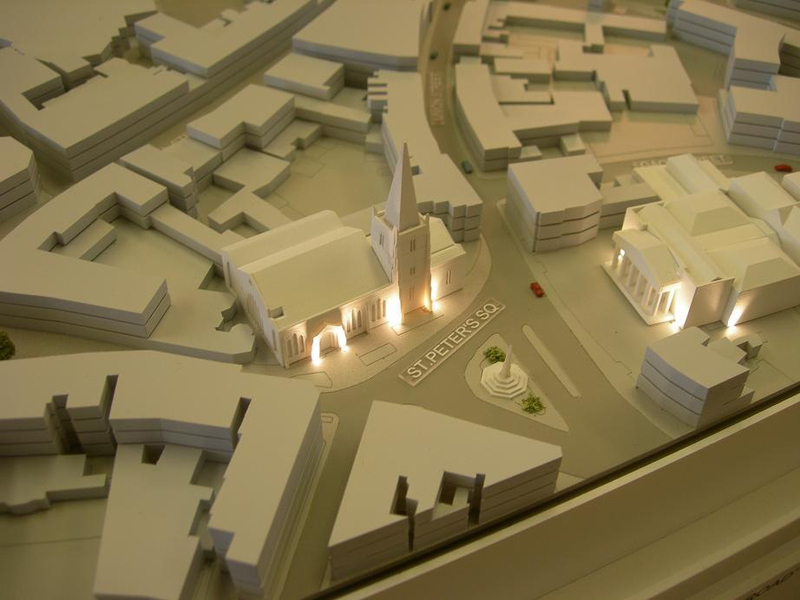 Maidenhead Masterplan Model 1:750 scale was perfect for this project because it allowed us to show a large area (a town centre) on a reasonably compact base but at the same time the buildings are large enough to appreciate storey heights and general massing. 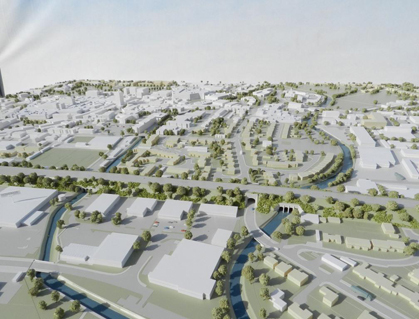 This model is 1.8m square and includes over 20 removable panels for the redevelopment zones which allows interchanging of different options so that each proposal can be viewed and assessed within the overall 3D context. 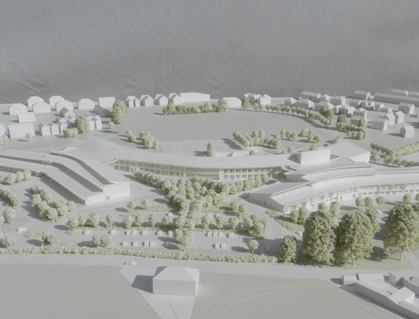 White School Model We’ve produced many of these white styled models because they’re ideal for presenting a non-specific, general overview of large spread out sites, such as this proposed school development. 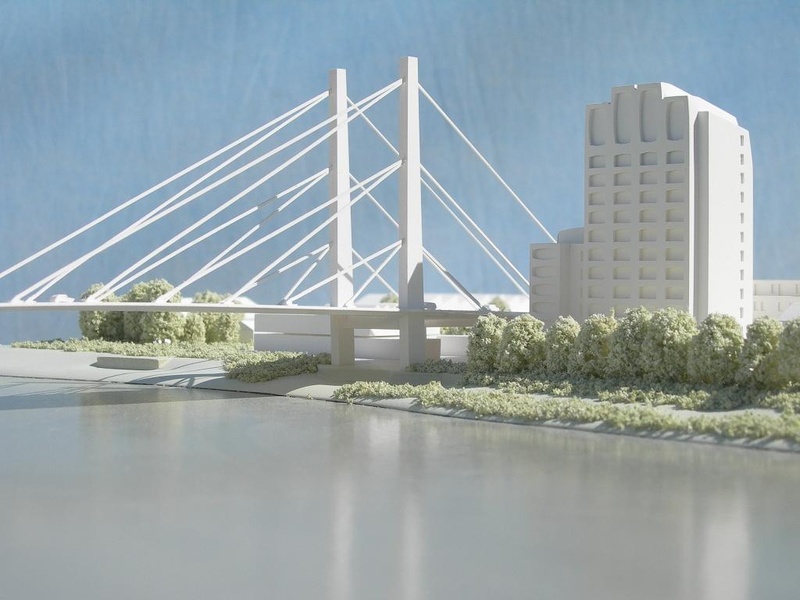 The monochromatic styling keeps the costs down and the small scale keeps the model base to a compact, portable size – approx 800mm x 700mm in this case. Despite the small scale, we are able to show a high level of detail on the buildings including clear acrylic for windows. 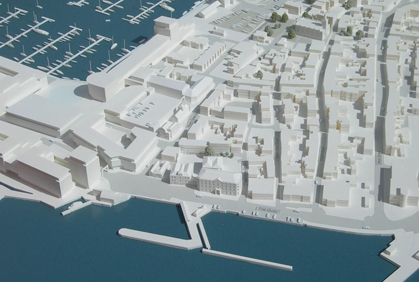 Block Model for Proposed Harbour Redevelopment This model demonstrates how three different levels of detail can be combined to create an informative, attractive but not overly expensive block model. The ordinary off-site context buildings are made with very simplified flat roofs; the landmark off-site buildings are made to a very detailed recognizable level, while the proposed new buildings (which are still only a concept design) are made to crisply detailed level somewhere in between. 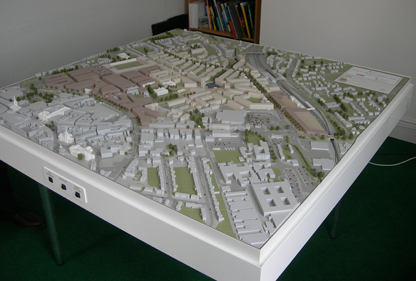 Redevelopment Area Planning Model This model was used to evaluate different proposals for a city centre redevelopment area. We built the context model and supplied templates so that each developer could create a drop-in panel that would fit into the main model. The model had various lighting features including a button that demonstrated the path of a famous FA Cup goal at the local stadium, complete with original commentary from a hidden speaker. Planning Application Model This is another excellent example of how clear and informative a 1:750 scale model can be, despite the main building being less than 50mm tall. 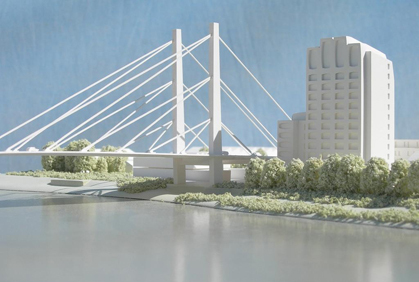 The proposed new building is made to a surprisingly detailed level with crisp representation of the architecture, including window fenestration. This style of model is quick and relatively inexpensive to produce but the clean, fresh appearance has charm and clarity, which goes a long way to help sell a scheme. Cardiff Bay Visitor Centre Model (Rebuild/Refurbish) Originally built in 1990, this huge model was in dire need of updating and refurbishing. The whole model had to be dismantled and brought to our workshops (in 28 pieces), where it was stripped back to its original components and completely re-sprayed and rebuilt. It was then reassembled back at the visitor centre, looking as good as new and ready for 15 more years of service. The buildings are made from beech wood. Some landmark buildings are highlighted in white. Detailed School Model It’s surprising how much detail can be shown at this small scale and this model is an excellent example. 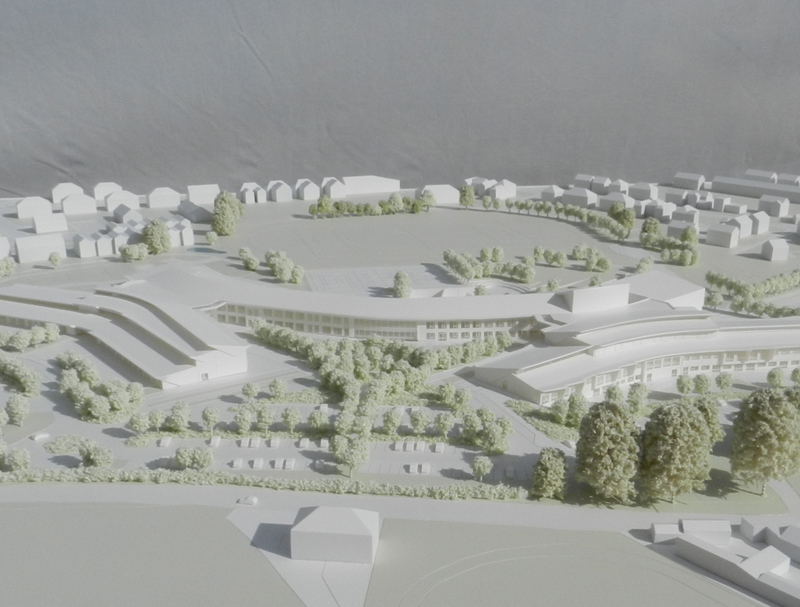 The use of colour brings the detail to life and gives a very realistic impression of how the proposed new buildings will look. 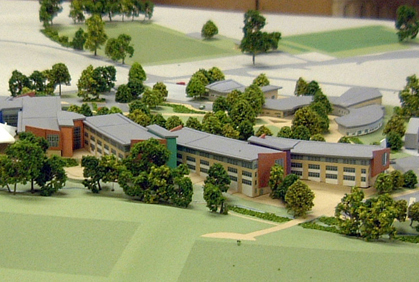 The model was accurately contoured to show how the group of buildings stepped down the sloping site. 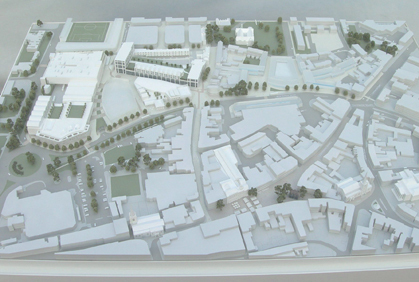 Masterplan Model The grey and white tones of this city centre masterplan model show an alternative monochromatic styling that can be adopted for these types of models. 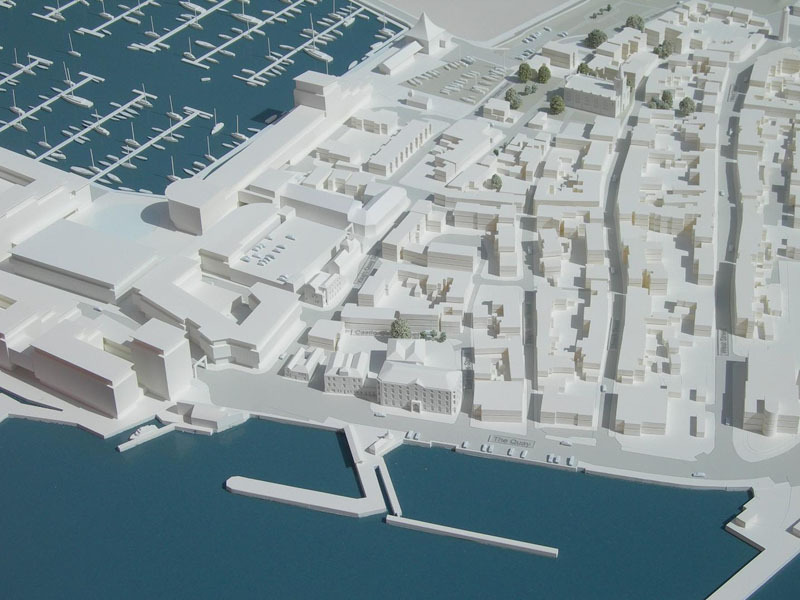 In this particular project the white buildings represent the proposed new build whist the light grey buildings show the existing townscape. If you click on the “enlarge image” button you’ll see that the new build is shown at a fairly detailed level.